Excelling in sales and customer service is essential for success in business, and the Fifth Annual Stevie® Awards for Sales & Customer Service, which were presented last night at the Eden Roc Renaissance Hotel in Miami Beach, Florida, recognized organizations and individuals for their recent achievements in these disciplines. The Stevie Awards for Sales & Customer Service is the world's leading sales awards, customer service awards, and call center awards program. The awards were presented by the Stevie Awards, which organizes several of the world's leading business awards shows including the prestigious American Business Awards. Winners of multiple Stevie Awards this year include Bulldog Solutions, CIGNA Government Services, Marsh U.S. Consumer, Overstock.com, Rosetta Stone, salesforce.com, Canada's SMART Technologies, and SuiteAmerica Corporate Housing. Other notable Stevie Award winners include Apple, L.L. Bean, the United Kingdom's T-Mobile, and Zappos.com. A complete list of all honorees by category is available at www.stevieawards.com/sales. Finalists and Stevie Award winners in the competition were determined by more than 125 judges over a three-month period. 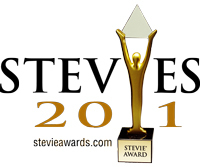 Winners in the Second Annual People's Choice Stevie® Awards for Favorite Customer Service, as determined by more than 177,000 public votes, were also awarded at the event to organizations including Archipelago Learning, Macy's, Marriott Vacation Club, PetRays, and India's TATA Motors Ltd. The event, attended by more than 200 executives from the U.S.A. and several other nations, benefited Camfed (www.camfed.org), which supports the education of girls and women in Africa. More than 800 entries from organizations of all sizes and in virtually every industry were submitted to this year's competition, an increase of more than 60% over 2010. There were 25 categories for customer service professionals, including Contact Center of the Year, Award for Innovation in Customer Service, and Customer Service Department of the Year; as well as 40 categories for sales professionals, ranging from Global Sales Leader of the Year to Sales Training Program of the Year to Sales Department of the Year. New this year were categories to recognize new products and services and solution providers. The Business TalkRadio Network will broadcast the awards presentations from 8:00 pm ET on Thursday, February 24 across the U.S.A. The broadcast may be heard worldwide on their web simulcast, at http://www.businesstalkradio.net. Sponsors of the 5th annual Stevie Awards for Sales & Customer Service include American Support, the Business TalkRadio Network, Competence Call Center, Infogroup, the Sales Management Association, and ValueSelling Associates.